Curacao is located approximately 40 miles (65km) north of Venezuela. The island is a constituent country of the Kingdom of the Netherlands, and was part of the Netherlands Antilles before its dissolution in 2010. 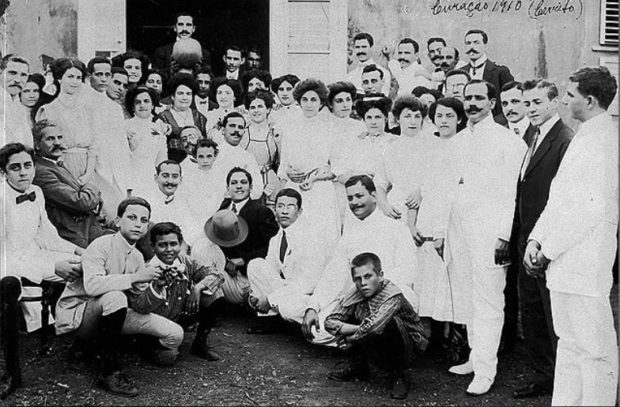 Group Photo of the Maduro, Marchena and Cohen Henriquez families, in country house “Cerito”,Curacao, Netherlands Antilles, 1910. (Beth Hatefutsoth Photo Archive, courtesy of Tita Mendes Chumaceiro, Curacao). The Mikve Israel-Emanuel Synagogue is the oldest surviving synagogue in the Americas and is generally referred to as the Snoa. Most of the island’s Jews are members of the congregation, while a minority are members of Shaarei Tsedek. Next to the synagogue is the Jewish Historical Cultural Museum. Mikve Israel offers regular services on Shabbat and holidays. Shaarei Tsedek offers weekly Orthodox services on Friday night, Shabbat morning, and Shabbat afternoon. The congregation has met in a striking new building with a transparent domed roof since 2006. 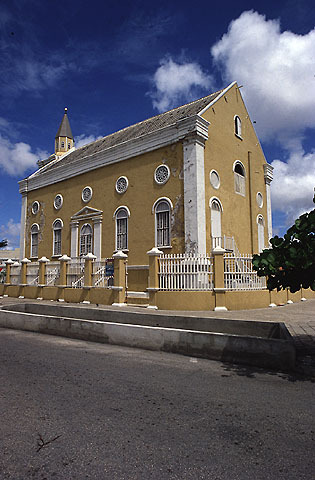 Facade of “Emanuel” Synagogue, Curacao, 1980. The Synagogue was inaugarated in 1864 and served the Reform community (established 1864) until the community was reunited with the Orthodox in 1964, adopting the reconstructionist ritual. Photo: Micha Bar-Am, Israel.